We have an immense selection of doormats. We have natural fiber mats, rubber mats, indoor/outdoor mats and more, but if you were to ask me which doormat will hold up the longest... I would answer without question... a Cape Cod Doormat! What exactly is a Cape Cod Doormat? These doormats are made in Hyannis, MA (a town at the start of Cape Cod) from 100% polypropylene. This twisted roping is woven to create a surface that cleans shoes remarkably well! The twisted nature of the rope scratches the undersides of your shoes and dislodges dirt and debris. What are other reasons that people love these mats? 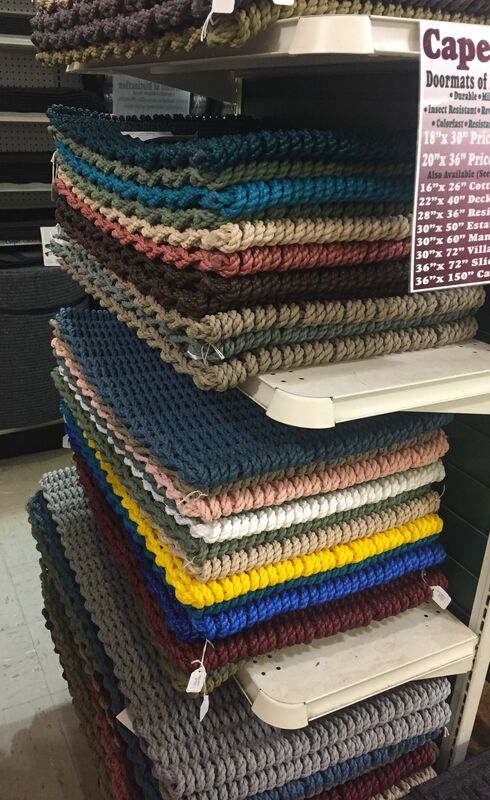 We have sold these mats for years, and the reasons that people love them are numerous. Some love how long they last, as I mentioned above. Others love how well they work and how they hold up tremendously well to all sorts of elements. The sun won't fade them and the salt won't break them down. They also float, so they hold up great on boats or even at the sea shore. Other doormats tend to hold water and can mold or mildew as a result, but not a Cape Cod Doormat; these doormats drain really well because of their oven weave polypropylene nature. And once one side wears down a bit, you can flip them over and use the other side! What sizes and colors are available? These doormats are available in 10 different sizes, from 16" x 26" all the way up to 36" x 150". We stock the most popular sizes, both the 18" x 30" and the 20" x 36". First choose your size, then choose your color. With more than 20 colors to choose from, you are sure to find just the right color to either blend in or to stand out amongst your surroundings! There are even a few different styles to choose from including the brand new Basketweave style.